Nepal is in the grip of electricity crisis. The electricity crisis of this millennium began in 2006. 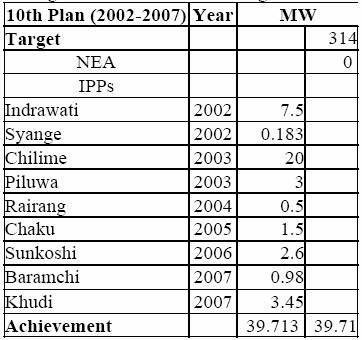 Nepal saw the last electricity crisis of the last millennium in 1999 and with the commissioning of Khimti project in 2000, there was no load shedding through till 2005. Earlier NEA used to ascribe load shedding to “no water in rivers.” However, since last wet season Nepal had to suffer from load shedding even while she had to struggle with “flood” problem. With no electricity for 16 hours a day, the last dry season was the worst so far. Nepal’s macro economy is suffering heavily due to the phenomenon. However, it is anomalous that even at the time of load shedding NEA has been spilling energy due to mismatch of system as well as transmission congestion. NEA has promised respite from the problem in next 5 yeas but the facts and figures do not corroborate the claim. GoN’s defective vision and short sighted policy is at the root of the problem which can be mitigated by setting the vision right and making the policy more forward looking and based on the principle of self-reliance. Key words: electricity crisis, load shedding, NEA, IPPs, adverse impact, anomaly, respite, GoN Policy, tariff, Nepal. The “load shedding” schedule, that Nepal Electricity Authority (NEA) publishes regularly, has become a must have document in every household these days, such that it has gained, though cynical, popularity amongst the consumers in Nepal. It must be admitted that, NEA is both fair and equitable in making electricity available (or conversely unavailable) as the number of hours consumers didn’t receive electricity (or received electricity) was same for all consumers within a region. Further, the hours that the consumers didn’t (or did) receive electricity was rotated such that no consumer received (or didn’t not receive) electricity everyday during the same window of time. NEA deserves to be complimented for its competence in preparing a fair and equitable load shedding schedule and implementing it with “punctuality”! From the above table it is clear that the load shedding of 4 hours/week and 16.5 hours/week during the rainy season last year could also be ascribed to the fact that a number of plants were not operating at its full capacity although there was no dearth of water in the rivers; of 617.28 MW installed capacity in the system at that time, the power plants were generating only 530 MW, although availability of water was not a problem. This implies that these plants were not properly maintained and, therefore, not generating at full capacity even during the wet season. In the dry season when a number of power plants are not able to generate to its full capacity due to paucity of water, necessary scheduled maintenance should have been undertaken. Looks like timely maintenance of these plants were not undertaken. 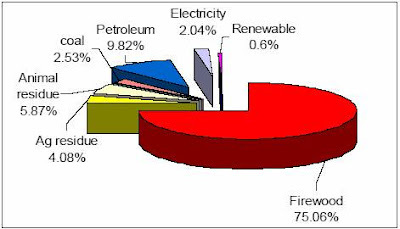 It is clear from the above chart that electricity as source of energy comprised only 2.04% of the total consumption of energy in 2007/8 while 85% of energy consumed was from the traditional sources like firewood, agricultural residue and animal residue. In the same year the remaining 12.35% comprised of imported sources like coal and petroleum products for which Nepal needed to shell out hard earned convertible foreign exchange (hard currency); entailing balance of trade deficit as well as balance of payment deficit. There exists another facet of the problem manifest in the above chart which can be seen from the example of industrial corridors in Morang-Susari districts, Bara-Parsa districts, Rupandehi district that are power-starved. It is estimated that each of these corridors require additional power of 200 MW but due to lack of generation of electricity in the country, industrial growth of the country is being suppressed and due to the same reason Nepali economy is literally stagnating (or haven’t been allowed to grow to its full potential). This is a kind of undeclared load shedding that also has severe adverse impact on industrialization of and employment generation in the country and consequently on the macro economy. This presents an unfortunate scenario for people of Nepal and its macro economy. It is also noteworthy that the actual load shedding in the dry season of 2009 was 16 hours/day instead of projected 10 hours/day. Having access to this information, NEA and other policy makers must have been in a position to prepare plans for an increase in generation. However, it is saddening to note that generation expansion has not kept pace with consumption growth. One of the problems behind this is the failure to complete project construction and commission in time – Middle Marsyangdi project is a prime example which was supposed to be completed in 2004 originally. However, looking at the magnitude of power deficit, it is not difficult to see that even with this project completed in a timely manner Nepal would have faced load shedding as the projects in the pipeline is not commensurate to growth of electricity consumption. 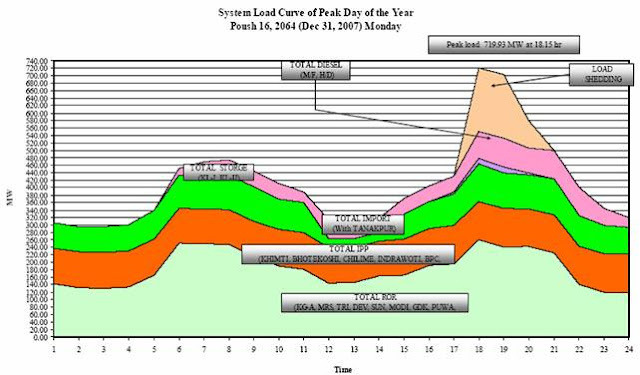 With the country facing load shedding due to supply constraint, people, ranging from the then finance minister (an economist, possessing doctorate degree) and many electricity experts (self proclaimed and otherwise), have been ascribing the current electricity crisis to the cancellation of Arun III in 1995, which was scheduled to be completed in 2005. However, this scribe, in his article published in Hydro Nepal (a journal of water, energy and environment) has proved that the ground reality is diametrically opposite to this contention. Like in all dark cloud, some silver lining has been seen in the load shedding problem of Nepal. Candle industry, which is a flourishing cottage industry of Nepal, has further flourished due to the electricity crisis obtaining in the country. It is heart warming to note, as candle industry has high level of backward linkage, that it must be contributing to the economy significantly. Perhaps many a marital relationships, undergoing some crisis, must have taken a turn for the better due to ubiquitous candle light during dinners frequently, even at homes! Similarly, sale of inverters, batteries, generators, solar panels, etc. also has increased by a magnitude. There is nothing to be happy about the increased turnover of these, as these have to be imported. In the case of inverters, the experts opine that use of inverters at home exacerbates the problem further as these mediums store energy inefficiently. Similarly, increase in the sales of generators has contributed to aggravation the fossil fuel crisis in the country besides contributing to environmental pollution. Due to time constraint, this paper is not able do an in-depth analysis of this aspect. Obviously the primary impact of load shedding is on NEA in terms of loss of revenue. In FY 2007/08 the deficit of electricity was 309.46 GWh and at average revenue rate of Rs 6.70/kWh NEA could have earned Rs 2.07 billion incremental revenue and would have been able to post a net profit of Rs 761 million, instead a net loss of Rs 1.312 billion, but for this crisis. There was a time when even hospitals suffered due to shortage of oxygen which was ascribed to unavailability of electricity. Similarly, factories operating for 3 shifts had to operate only 2 shifts and those operating 2 shifts had to scale down to 1 shift. It even became difficult to operate a factory for a particular shift contiguously as the load shedding occurred in the middle of a shift which posed a new kind of challenge. Especially adversely impacted were the industries that needed to keep operating their boilers or furnaces 24 hours a day as restarting these after a stoppage impacted the industry grievously because reheating or restarting a boiler was a costly affair and substantial amount of materials had to be wasted in the heating and cooling process. In order to mitigate this problem, a number of industries acquired standby generators which increased the fossil fuel crisis by a magnitude. On the other hand, even after procurement of standby generators many industries were forced to stand idly by as they were unable to operate even the standby generators due to shortage of fossil fuel to operate them. From this, it is clear that as a result of the electricity deficit of 309.46 GWh, the cost to the economy of Nepal amounted to a whopping Rs 3.25 billion due to planned interruptions (at the rate of US 14 ¢/kWh, equivalent to Rs 10.5). The study referred to here has used the cost of operating standby electricity generation to arrive at the cost of planned outage as the main component of it. However, as even just the fuel cost of the stand by generator exceeds Rs 15/kWh, this estimate is on the lower side. Besides, this computation also ignores the cost of the chain impact on the economy in terms of lost employment, loss of purchasing power resulting in loss of demand for goods, consequential loss of revenue by the Government of Nepal (GoN) etc. due to unavailable power; all these culminating in reduction of GDP – the opportunity cost. Therefore, the loss to the macro economy is exponentially higher. However, it is beyond the ambit of this paper to deal with this issue. Further, the load shedding problem also aggravated and compounded the fuel crisis as various factories, even shops and some households started using generators to mitigate the problem of load shedding. Besides, the use of fossil fuel as an alternative to electricity increased environmental pollution (due to industries, shops etc. using backup generators) including indoor pollution. There is a note worthy anomaly in all this – spilling of electricity (wasting generation capacity) in the midst of load shedding. In fiscal year 2007/8, as mentioned earlier, the energy demand totaled 3,490.12 GWh while available energy was 3,180.66 GWh only resulting in a deficit of 309.46 GWh. However, NEA spilled 223.378 GWh of this precious commodity during the same period. The problem can be attributed to the mismatch of system. Nepal’s system predominantly comprises of run of the river power plants that generate more during rainy season while generating close to one-third of the capacity with the discharge in the rivers going down. On the other hand, consumption pattern in Nepal is diametrically opposite of generation by RoR projects – high quantum of electricity consumption in the dry season (winter) and low consumption during wet (rainy) season. Kulekhani I and II – totaling 92 MW – is the only storage project in Nepal, generation from which could be tailored to the demand. Therefore, the peak-in energy generated by these plants is at premium. But the source of water of this reservoir is not reliable rivers with significant flow. These reservoirs depend on localized rain (cloudburst) to replenish the water. The water collected in this reservoir should have reached the elevation of 1,530 m during the rainy season last year. “The monsoon has come to a close but the water level reached only 1496 m.” Previous year the water level had reached 1516 m. This too contributed to the severity of load shedding in the last dry season. Besides, it should also be noted that the dead storage of this reservoir has already reached 25% level (that is the capacity of the reservoir is only 75% of what was originally built for). Moreover, instead of using peak-in power from Kulekhani only during peak periods – in both dry and wet season – NEA is forced to use it during other times, especially for the Birgunj-Parwanipur industrial corridor due to transmission congestion in Hetauda-Bharatpur transmission network. There were times when NEA spilled energy generated by Kali Gandaki A project while using electricity from Kulekhani even during normal and off-peak periods. There is another facet of this spill story. In 2006 spring a Nepali businessperson based in India, who had lined up buyers for the spill energy as such, approached NEA to sell such spill energy. However, unfortunately for NEA and the nation, no deal could be struck for the purpose. The person even demonstrated his sincerity by not asking NEA to sale the spill energy to him without completing the due process in a transparent manner. He specifically suggested to NEA that it do so in both competitive and transparent manner and let the bidder offering best price strike the deal. The proposal didn’t make any progress whatsoever. It is heartrending to note that even selling such energy at Rs 1 per kWh, NEA could easily have collected Rs 223 million which would have reduced the net loss to that extent. After implementation of the above mentioned projects, the total anticipated generation capacity in the system will be 1493.38 MW. However, whether the promise will be kept depends entirely on NEA, how it functions, etc. Let’s make an attempt to examine if NEA will be able to keep the promise. 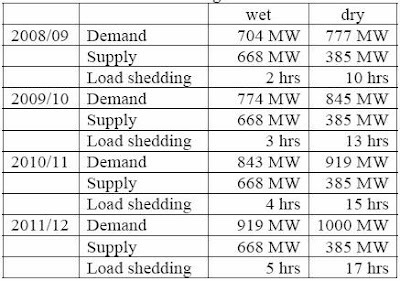 According to the load forecast of NEA (Table 5 above) the peak demand in 2013/14 will be 1271 MW and as total available in the system will be 1493 MW, superficially it would seem that there will not be any need for load shedding. However, even ordinary consumers (without understanding the technicalities of electricity generation) have learnt by now the hard way that during the dry season (when the demand for power reaches its peak) hydropower plants do not generate to their full capacity. Therefore, in the promised year 2013/14, the peak demand will be 1271 MW while with the total generation capacity of 1493.38 MW NEA will be able to generate only in the order of 7-8 hundred MW or less during the dry season. Specifically speaking, with an installed capacity of 617.38 MW in the system, 2768.25 GWh was generated in FY 2007/8, achieving a plant factor of 51.19%. Therefore, if the total installed capacity is to reach 1493.38 MW in FY 2013/14, at the plant factor of 51.19% the generation in the dry season will be 764.40 MW only and there will be resultant shortfall of 506.60 MW; consequently a scenario for definite load shedding. Conversely, to meet the projected demand of 1271 MW in that particular year the required installed capacity works out to 2483 MW, at the plant factor of 51.19%, which is an increase by 1865 MW. Unfortunately for the consumers of electricity in Nepal GoN is aiming to add only 876 MW by that year. A sure shot scenario for continued electricity crisis in and through 2013/14. Moreover, it also needs to be remembered that generation capacity will reach 1493.38 level in that year only if all the projects are commissioned in timely manner as specified in the table 7 above. 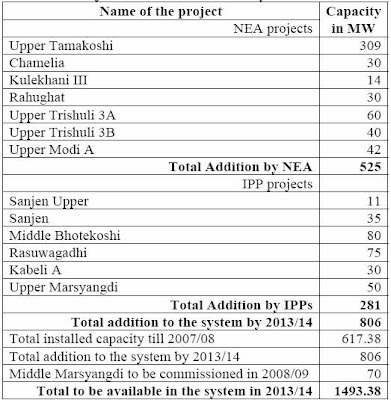 NEA, unfortunately, does not have a track record of completing its hydropower projects without incurring significant time overrun since the days of Kulekhani which becomes clear from the following table. 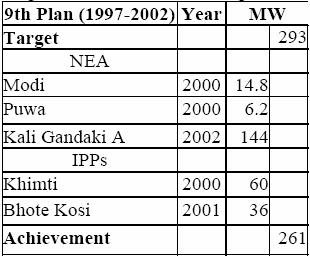 Furthermore, above table 7 also anticipates addition of 281 MW by the private sector by that time. For this purpose the private investors need to able to execute power purchase agreements (PPAs) with NEA. From the information available till now (at the time of writing this paper), no PPA has been signed with any of the projects listed above in table 7. 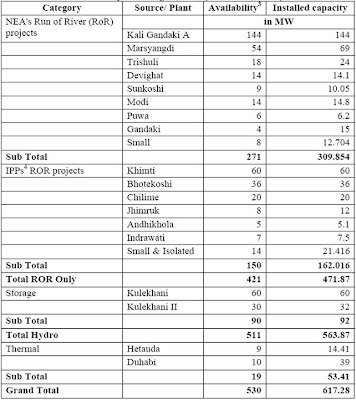 In view of this, the likelihood of adding 806 MW by 2013/14 is rather remote. Therefore, even if 806 MW is added to the system there will be a short fall of 506.60 MW and, hence, load shedding. If any of the projects listed aren’t commissioned in time, the gap between demand and supply will be wider and the electricity crisis will be more severe. This indicates that there is something seriously wrong at various levels like, comprehension of the problem, planning to mitigate the problem and also in the implementation of the projects. Basically seriousness in understanding the problem is lacking and in such a scenario measures to mitigate the problem too tend to be rather sketchy. 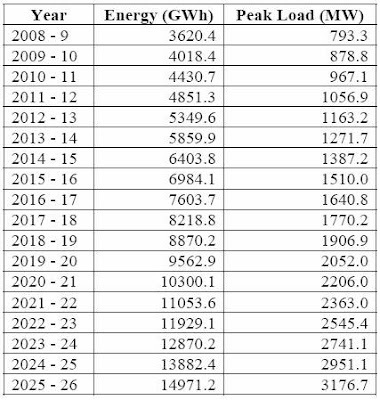 Nepal’s Water Resource Strategy stipulates that “by 2017, 2230 MW hydropower developed to meet projected demand of 2230 MW, including 400 MW for export.” According to load forecast prepared by NEA (table 5 above) peak demand in FY 2017/18 is estimated at 1770.2 MW and to meet this level of demand the installed capacity will have to be at least or more than 3500 MW as power plants generate at around 50% of the installed capacity. Therefore, with 2230 MW in the system it will generate only about 1115 MW during the dry season and, therefore, the plan to export 400 MW will not be possible. Actually, if the peak load is 1770.2 MW and generation reaches 2230 MW level, the continuance of load shedding will be definite. From this it’s clear that the authors of the strategy lacked necessary vision in terms of consumption pattern in Nepal and intricacies of generation plans and plants. With regard to how much power Nepal can use one needs to think outside the box and look at the issue from a different perspective. If Nepal’s economic potential of 43,000 MW is to be harnessed at the plant factor of 51.19% (current standard of Nepal’s system), the electricity available will be 7140 kWh per capita for the current population of 27 million. With the population expected to reach 42 million in 2030, the electricity available will be a meager 4590 kWh per capita. This point is being belabored here to link electricity consumption with the prosperity of a nation and its populace due to forward linkaged benefits like industrialization, employment generation, import substitution, etc. Nepal can even escape from current petroleum product crisis significantly by electrifying transportation system (ranging from electric train, trolley bus, cable car, ropeway, electric bike, etc. to even hybrid car). Actually Nepal should aim to maximize use of power generated by harnessing its water resource domestically and also benefit by forward linkaged benefits. Use electricity to lift water to irrigate, to run cold storage, to set up agro-processing industries, use for industrialization of Nepal, also to set up energy intensive industries. One needs to remember that most of the prosperous countries consume electricity above 10,000 kWh per capita (Iceland consumed 31,147.292 kWh per capita in 2006 — the highest in the world) and for Nepali consumers to use 10,000 kWh per capita the installed capacity necessary will be in the order of 61,000 MW which is a lot more than even the economic potential of Nepal (43,000 MW). In this backdrop, it is disingenuous to say that Nepal has excess capacity. Therefore, the policy and strategy adopted by the government based on the assumption that Nepal has excess hydropower potential, the only use of which is exporting it to a neighboring country is at the root of all the problems. Presently the policy is focused on getting free energy by allowing developers to implement projects as export oriented. Which results in cheap and better quality electricity being exported (example is West Seti, Upper Karnali and Arun III) while condemning people in Nepal to live in the dark due to load shedding, leaving industries to starve for energy and continuing with long queues for petroleum products that pollute the environment and make people sick, increasing the absenteeism from work, and spend hard earned money on medicine and medical treatment. All problems have solutions and load shedding problem is not different. In following lines an attempt is being made to come up with certain suggestions as to how the problem is best mitigated. However, due to time and space constraint, all the issues could not be dealt with here exhaustively, although one could come up with many more suggestions. GoN Policy: Nepal government should have a policy to implement as many hydropower projects as possible with domestic investment so that investment linkaged benefit will percolate into the economy. This does not mean that we should close our doors to foreign direct investment. As long as the electricity is used for the benefit of the country who is investing in the project does not matter. Secondly, Nepal should allow projects to be implemented by the investor/s (domestic or foreign) that will generate the electricity at the lowest cost. Nepal should purchase all such power (at lowest possible price) and electrify the nation massively (not just for lighting a few bulbs in houses, though) and export the electricity that Nepal is not able to consume at premium price (India had asked for 7 Indian rupees to export power from a plant in Tripura to Bangladesh). What Nepal should do is, instead of dedicated export oriented power projects, she should plan to export energy during wet seasons and off peak hours when she needs to spill her electricity generation capacity while during the same window of time the electricity demand in south is at its peak, thus commanding premium tariff. In this manner we could easily get out of the trap of long term PPAs and also take advantage from the complementarity of electricity market of Nepal and India. Nepal is facing the contradiction of having to pay higher price to import from India while exporting from Nepal at substantially lower rate. What is happening is a natural phenomenon in this kind of market. From the perspective of export of power from Nepal to India there is a monopsony market condition and it is but natural that the importer enjoys “market power” and is able to dictate the price. Besides, in the power market it is also a fact of life that longer PPAs fetches lower prices while the shorter ones higher price. To illustrate the point, West Seti project has a longer PPA term, and has been given lower price while (reportedly of US 5 ¢), when Nepal imports power from India we do it for short term, and pay high price. Besides, it should be obvious to all that Nepal may, for example, not be able to use full generation of West Seti project only for first few years, after that Nepal will be in a position to use close to half of it. In about a dozen years, Nepal will definitely be able to use all electricity generated by this project. In view of this too, it is not advisable to get into longer term PPAs. It is interesting to note that the oldest license for project in the range of 1-10 MW was issued in September 2004. Similarly, in the 10-100 MW range the oldest license was issue in January 2005. Further, the oldest license for projects larger than 100 MW was issued in March 2005. For some projects the survey licenses were issued in early 2000 and were “reissued” after the licenses lapsed on expiry of 5-year license period. From this it can be fairly inferred that the “developers” securing licenses either don’t possess capability to mobilize financing or aren’t interested to actually implement the projects. This state of affairs not only precluded the genuine developers/investors from implementing the projects and alleviating the electricity crisis but it also deprived GoN from revenue stream from capacity and energy royalty that would have flown in had these projects been implemented. Therefore, GoN policy needs to be amended to make it difficult for people without financial capability to hoard licenses; it has been seen that some licensees even don’t have necessary resource to conduct the survey (feasibility study). It is recommended that survey licenses be issued only after bank guarantee covering 10% of the cost of the project is furnished to GoN; the licensees to forfeit such guarantees if the project isn’t implemented at the end of the survey license period. Infrastructure: Private investors have discovered that investment in electricity generation project is a lucrative business. However, they are constrained by lack of infrastructure like transmission network and access road. From a section of this paper above we have seen that private sector, indeed does have comparative advantage in building power plants both from the perspective of time and cost (in successfully avoiding time and cost overruns). Therefore, NEA should launch a campaign to build transmission network and if it is constrained by financial considerations, then she should, to use an old euphemism, beg, borrow or steal to build the transmission network where it enjoys both comparative and competitive advantage. What is being forgotten here is the fact that India herself is facing an electricity crisis of a higher magnitude and it will not be easy for India to come to Nepal’s rescue when its own citizen are suffering. Moreover, the connection points proposed, across the border in India, like Gorakhpur, Purnea and Muzaffarpur are load centers suffering acute power deficit. The only exception is Silguri, which, unfortunately has not been prioritized. In reality, these cross border connections are being planned to be built to evacuate power from Nepal to India from the export-oriented projects already bagged by Indian developers or other developers in collaboration with Indian investors and some more that will be bagged. This becomes clear by looking at the highest priority accorded to Dhalkebar-Muzaffarpur trans-border transmission line that will be used to evacuate power from Arun III and Tamakoshi projects in Nepal. Actually if one is to look at the concept closely, it is an excellent modality to make the NEA invest in erecting a transmission line for India to import power from Nepal. In the normal course, transmission lines are built by the importer or the developer of export-oriented power projects.What is being forgotten here is the fact that India herself is facing the electricity crisis by a higher magnitude and it will not be easy for them to come to Nepal’s rescue when its own citizen are suffering from it. Moreover, all the connection points proposed across the border in India, like Gorakhpur, Purnea and Muzaffarpur (except for Silguri), are load centers suffering power deficit. In reality, these cross border connections are being planned to be built to evacuate power from Nepal to India from the export oriented projects already bagged by Indian developers and some more that will be bagged. Actually if one is to look at the concept closely, it is an excellent modality to make NEA invest in erecting a transmission line for India to import power from Nepal. In the normal course transmission line is built by the importer or the developer of export oriented power project. Delayed Completion of Projects: A part of the load shedding problem is attributable to construction delays. Implementation of hydropower projects by NEA is fraught with both cost overrun and time overrun risks as the experience shows. Therefore, the best use of national resource is to have hydropower projects implemented by private sector that seems to be able to implement projects effectively and efficiently both in terms of cost and time. However, it doesn’t mean to say that NEA should not be involved in the construction of hydropower projects at all. What it needs to do is to learn lessons from the projects it was involved in the implementation in the past. All along NEA have had a spate of double trouble of suffering from both cost overrun and time overrun. In order to mitigate this problem NEA should review structure and content of construction/supply contracts that it signs with contractors and suppliers and adopt construction/supply contracts which are not open ended (fixed time and fixed price) – not affording any latitude for increase in cost or completion time (to use the popular phrase with no scope for any “variation order”). System Mismatch: With the total installed capacity of over 687 MW now, the system is generating less than half of that during the dry season when the demand is at its peak, thereby creating electricity crisis. Nepal not only needs to have a reliable storage project in its stable but she should also supplement peak period demand by implementing daily pondage projects. NEA should also seek the cooperation of private sector to solve the system mismatch problem, by introducing bulk time-of-day tariff besides the seasonal variation in the tariff as it has now adopted for projects of up to 25 MW. In other words, it should have provision for time-of-day tariff with seasonal variation for projects of all sizes such that building a storage (or daily pondage) project will become lucrative for the private sector too. Besides, an array of reasons behind the plan failure as such, the main constraint during the period was the lack of investment friendly environment due to Maoist insurgency. Investment friendly environment, manifest in political stability and law and order is sine qua non to attract investment, especially in hydropower which is of capital intensive nature. Loss control: NEA announced that its net system loss was 25.15% in 2007/08 and 26.71% in 2006/07. This is total of both technical and non-technical loss. Technical loss can be significantly reduced by up to 7-8 percentage points by strengthening the transmission network which will definitely help in reducing load shedding duration. Currently, reduction of 1% loss is tantamount to conservation of approximately 7 MW of power (one could even say that is equal to adding 7 MW to the system). Its costs at least Rs 1 billion to add 7 MW but to strengthen transmission line to conserve 7 MW, it will cost less than Rs 50 million. It is true that reduction of non technical loss will not help reduce duration of load shedding. But curtailing non technical loss will result in providing electricity to the consumers who are happy to pay instead of allowing someone else to steal it. Smart Retail Tariff: At present NEA has a specific slab structure of tariff for all kinds of domestic consumers irrespective of whether their demand for electricity is elastic (whether consuming it for luxurious uses like operating air conditioner, refrigerator or laundry machine) or not (use it just to ward off darkness). It needs to introduce time of day tariff with seasonal variation to all consumers so that people will use less electricity when pressure on peak demand is high or those who prefer to continue with their luxurious life style with no concern for price should be made to pay higher tariff. Actually this is the best way to curb load shedding; allowing demand and supply to find an appropriate price. Moreover, NEA has a social tariff of Rs 4/kWh up to 20 kWh – at which rate NEA doesn’t recover its cost (of generation, transmission plus distribution). Under the current policy the social tariff is not limited to indigent people only. In other words, NEA is availing this tariff to all domestic consumers across the board; irrespective of whether the power is being consumed for luxurious purposes or not and whether the consumer deserves the subsidized tariff or not. Therefore, NEA tariff should be amended to make social tariff available to only those who deserve it – poorest of the poor. Under a crude estimate, just with this one change NEA will earn incremental revenue of Rs 1 billion. Encourage Private Sector to Install More Capacity: Due to increase in the cost of construction materials like steel, cement, etc. private developers are asking for an increase in bulk tariff NEA offers to the private sector. But NEA’s hands are bound as it is in no position to raise retail tariff without which it will be forced to incur loss of higher magnitude. The way out is to keep the bulk tariff at the same level but for GoN to exempt power projects from all import duties. GoN needs to understand that it doesn’t make sense for it GoN to earn revenue while NEA is hemorrhaging because NEA is also fully owned by GoN. Instead of revenue from duties, GoN should vie to reap benefit by the multiplier effects that will be caused by electrification of the country. To give a simple example, it is better to lose import revenue and have the country use more electricity from which more employment will generated, leading to rise in people’s incomes (they will pay income tax), peoples consumption will rise (from which government can collect excise duty and value added tax), etc. than attempt to collect revenue which will discourage implementation of hydropower projects leading to continued load shedding and the economy stagnating for lack of energy. What the government needs to remember is that sacrifice of revenue by it to increase domestic consumption will eventually enrich the macro economy, hence the government, gaining from the multiplier effect on the economy due to forward linkages of electricity uses. Same is not true in the case of export oriented projects. If such import duty facilities were to be granted to export oriented projects, the economy not only loses the revenue stream from the tax and duties, but Nepal’s economy also is deprived of the benefit of economic linkages. It is rather tragicomic to have a country like Nepal, richly endowed with water resources, suffer from the problem of load shedding. Almost a case of paucity in the midst of plenty (actually not really true as only generation potential is there but the shortage is due to no generation) which is parallel to another cliché: water, water everywhere, but not a drop to drink (a little closer to truth). Besides, the problem is not too difficult to solve if only the hydrocracy (intelligentsia, politicos and bureaucracy involved in hydropower sector) starts to think outside the box. The problem is rooted in the tunnel vision. Because, although NEA has promised respite from it by 2013/14, it is clear from above discussion that even if the projects in the “pipeline” are commissioned by the promised date, the load shedding will not vanish. If projects, god forbid, do not materialize as envisaged, time will come when people will start talking about when will the electricity be available (like water in the taps), rather than when electricity will not be available. The load shedding is not happening because the decision makers are unable to figure out what will be the demand for the years to come or such data is not available to them. If the status quo is to continue, then Nepal will be condemned to have it as a standard phenomenon, because correct decisions – with regard to policy as well as with regard to when to start implementation of specific project to augment generation capacity – are not taken at appropriate time, the bureaucracy is unable to ensure that the projects under implementation are completed within expected time. The need of the hour is to have a paradigm shift. Due to unavailability of relevant data for last fiscal year (2008/9), this paper is being written on the basis of data of FY 2007/8. Availability shown here is machine and water availability but due to flood, debris and sediments during this rainy season, availability may be affected in real time. Source: Fiscal Year 2007/08 – a Year in Review of NEA. The load shedding hours increased exponentially to 16 hrs a day during the dry season of FY 2008/9. In FY 2008/9 the demand increased by 90.47 MW while only 71.975 MW was added to the system. However, the deficit between demand and supply wasn’t merely 19 MW as the added capacity to the system would generate at less than 50% of the capacity during the peak season. Source: NationMaster.com of June 2007. “Toe” stands for tons of oil equivalent. Source: Ministry of Finance, Economic Survey 2006/7. As government of Nepal (GoN) is yet to publish Economic Survey for 2007/08, this paper is based on one year old publication. On the condition that Middle Marsyangdi, 70 MW will be completed in 2008/09 (it was actually inaugurated by PM Prachanda in December 2008). Shrestha, R.S., 2009, Arun-III Project: Nepal’s Electricity Crisis and its Role in Current Load Shedding and Potential Role 10 Years Hence in Hydro Nepal: Journal of Water, Energy and Environment, Vol. 4. As the calorific value of 1 liter diesel is between 3 kWh to 3.5 kWh. The noise pollution, especially in malls and supermarkets, is unbearably high when these generators are operated. NEA, 2009. System Operation – A Year in Retrospect. 70 MW Middle Marsyangdi was commissioned in December 2008. “Monopsony” is a market situation when there is single buyer; contrasted from monopoly market in which many buyers vie to purchase from single seller. This table and the one immediately following was compiled by the author on the basis of information from National Planning Commission and NEA. Aashutosh, though reflecting his worst attitude has rightly stated that other sources are not included in the article. He wants 1000 page book and not an article where everything is covered. Moreover what other sources of electricity means? In case he is referring to Inverter, he is wrong as inverter is charged by NEA grid. Solar power is negligible and will not change the data materially. Generator ???? ....do you have any data ??? . I am not sure if this article really worth with the knowledge education level of some people. Learn to appreciate other people. good analysis need more updated article in coming days. Your article on Karnali project in "Yo Sata"
माथिल्लो कर्णाली आयोजनाको बिरोध - कति जायज ?